Our staff are pros! Combine this with ISO-9000 certified quality assurance and our 'can do' attitude towards our customers. We guarantee your satisfaction. 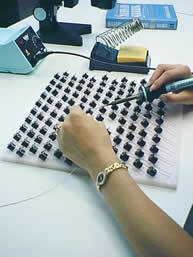 We supply the electronics industry with the finest hand-wound components and soldering services. Specializing in Wire-wound Components, rf Chokes and Transformers, Through-Hole and Surface Mount, Wiring Harnesses and Cable Assemblies. Our clients claim that our quality exceeds what they can do themselves. We combine affordable American Quality with zero lead-time for starting your project. Why deal with the hassles of going overseas? We understand your critical production schedules and need to stay in line with your budget. Our nimble size allows us to turn on a dime! We make sure that its done correctly, on time and economically.